One of my fondest memories is of when Matthew and I lived in San Francisco and one morning he walked 45 minutes to my favorite muffin shop and bought me one for when I woke up. Not only did he walk all that way, but he bought my favorite kind, a bran muffin. 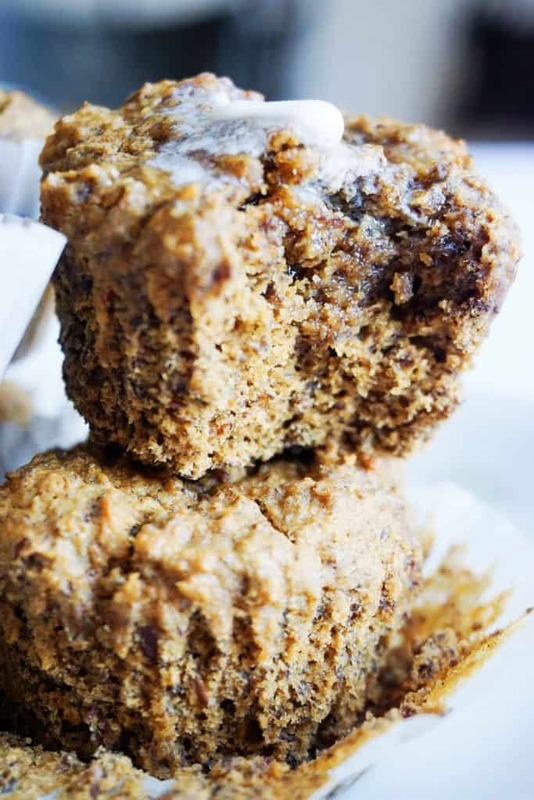 This High Fiber Muffins recipe is my keto remake of bran muffins, and they hit the spot! Not only will you be getting your fiber fill for that day, but now you can associate them with the love that grew between Matthew and I. When it comes to breakfast I'll pretty much eat anything. Put a bowl of soup or a bowl of keto oatmeal in front of me and I'll eat it happily! That was until I created these muffins! Now, my go to breakfast isn't even bacon egg cups anymore. I'd much rather grab a couple high fiber muffins, which taste heavenly, especially when warmed with some butter. Not only are these high in fiber, but they supersede all breakfasts for me due to their high fat content! Fiber is proven to decrease hunger so why not eat as much as you can! The secret ingredient in this recipe is Oat Fiber and we really don't want to keep it secret any longer! It's our new favorite keto baking ingredient. What makes it so great? It's a zero calorie additive because of the high fiber count, it gives off an oat flavor without having to use actual oats, and it creates a moist, hearty baked good. We've used it in breads and cookies also and it never ceases to amaze us. We kid you not, this is an ingredient to have in your pantry, especially if you love baking! These muffins are also great for meal prepping which is something Matthew and I implement often. It makes having to take meals to work so much easier and allows me to be more productive instead of thinking about food all day. If you're into meal prepping or are thinking about starting you should also definitely give our chili with bacon and e﻿﻿asy gluten free popcorn chicken a try! Although they aren't high in fiber, need not worry because our High Fiber Muffins got you covered. Recipe can be quickly added to MyFitnessPal - Search "KetoConnect - High Fiber Muffins"
In another bowl melt butter and add erythritol. Combine well. Add eggs, heavy whipping cream and vanilla and combine. Add dry ingredients to wet mixture and combine well. Dough will be thick and sticky in consistency. Grease muffin tin or place cupcake papers into muffin tin and distribute the mixture evenly among 12 muffins. Bake at 350 for 15 minutes. Use toothpick to test once done. Serve warm with butter and enjoy!